London Welsh captain Tom May has urged his side to embrace the pressure on them ahead of Sunday's Championship semi-final first leg with Leeds Carnegie at Headingley. 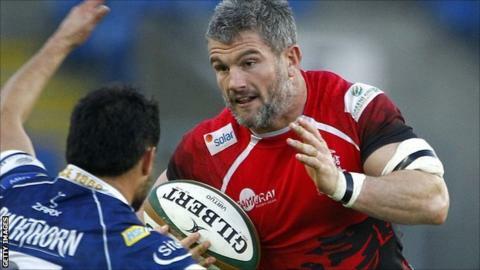 Welsh are looking to return to the Premiership at the first time of asking following their relegation last term. They, along with Leeds, Bristol Rugby and Rotherham Titans are involved. "You cannot fear pressure, you have to embrace it," May told BBC Radio Oxford. "There are no second chances, it's an opportunity that comes around in players' careers not too often, whether that be playing in the Premiership or playing to get into the Premiership. "I've been lucky enough to play in the Premiership and I loved every minute I played. "Now is an opportunity to progress from the Championship and get this club back to where we feel it should be." Welsh came out in top in both of the sides' previous meetings this season - the Exiles winning 31-24 at Headingley Carnegie in November, before grinding out a 19-10 victory at the Kassam Stadium in January. And former Northampton, Newcastle and Toulon centre May knows his side face a stern challenge despite their record over Leeds. "The top four are all good teams and whoever you play is going to be up for it and will be a test," he said. "The way they play the game is exciting to watch and we know what to expect. We've done some good analysis, have been working hard and are looking forward to getting out on the pitch. "Everyone has to make sure they are on form to come out on top. "Home and away is not an easy task, Leeds are a tough outfit and we have two really good games so we are expecting much the same on Sunday." Meanwhile, the RFU Board has confirmed that all four clubs have satisfied the Minimum Standards Criteria for entry into the Premiership, based on the following stadia: Ashton Gate (Bristol Rugby), Headingley Carnegie Stadium (Leeds Carnegie), Kassam Stadium (London Welsh) and Oakwell Stadium (Rotherham Titans). London Welsh team to face Leeds: Alex Davies, Seb Stegmann, Tom May (C), James Tincknell, Nick Scott, Gordon Ross*, Chris Cook, Nathan Trevett, Nathan Vella, James Tideswell, Will Spencer, Matt Corker, Daniel Browne, Carl Kirwan, Ollie Stedman. Replacements: Nathan Morris, Tom Bristow, Peter Edwards, Pete Browne, John Quill, Tyson Keats, Alan Awcock.